Asturias ( , ), officially the Principality of Asturias (Spanish: Asturian: ), is an autonomous community in north-west Spain. It is coextensive with the province of Asturias, and contains most of the territory that was part of the Kingdom of Asturias in the Middle Ages. Divided into eight comarcas (counties), the autonomous community of Asturias is bordered by Cantabria to the east, by Castile and León to the south, by Galicia to the west, and by the Bay of Biscay to the north. The most important cities are the communal capital, Oviedo (Uviéu or Uvieo), the seaport and largest city Gijón (Xixón), and the industrial town of Avilés. Other municipalities in Asturias include Cangas de Onís (Cangues dOnís), Cangas del Narcea, Gozón, Grado (Grau or Grao), Langreo (Llangréu), Llanera, Laviana (Llaviana), Lena (? ?ena), Llanes, Mieres, Siero, Valdés, Vegadeo (A Veiga) and Villaviciosa (see also List of municipalities and comarcas in Asturias). Asturias is also home to the Prince of Asturias Awards. 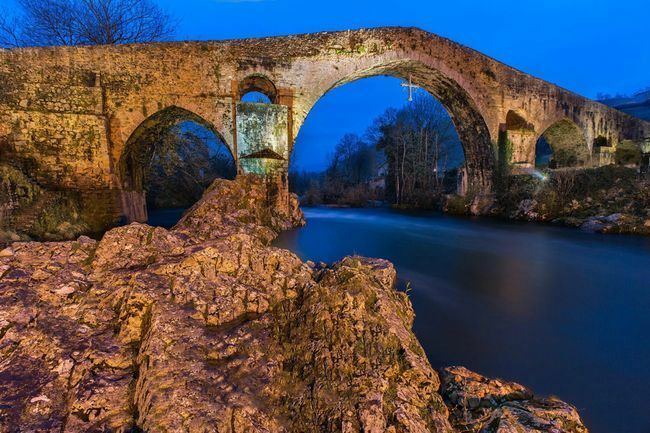 Asturias has been inhabited, first by Homo erectus, then by Neanderthals and finally by modern humans, since the Lower Paleolithic era, and during the Upper Paleolithic was characterized by cave paintings in the eastern part of the area. 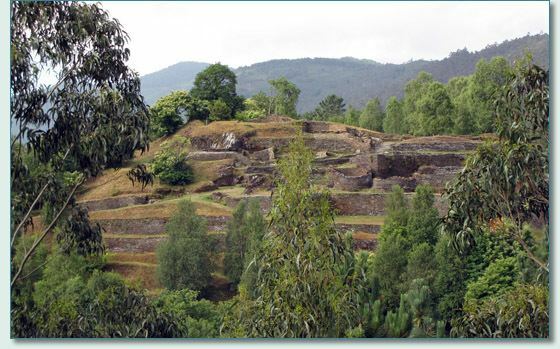 In the Mesolithic period, a native culture developed, that of the Asturiense, and later, with the introduction of the Bronze Age, megaliths and tumuli were constructed. In the Iron Age, the territory came under the cultural influence of the Celts; the local Celtic peoples, known as the Astures, were composed of tribes such as the Luggones, the Pesicos, and others, who populated the entire area with castros (fortified hill-towns). Today the Astur Celtic influence persists in place names, such as those of rivers and mountains. With the conquest of Asturias by the Romans under Augustus (29–19 BC), the region entered into the annals of history. After several centuries without foreign presence, the Suebi and Visigoths occupied the land from the 6th century AD to the beginning of the 8th century, ending with the Moorish invasion of Spain. However, as it had been for the Romans and Visigoths, the Moors did not find mountainous territory easy to conquer, and the lands along Spains northern coast never fully became part of Islamic Spain. Rather, with the beginning of the Moorish conquest in the 8th century, this region became a refuge for Christian nobles, and in 722, a de facto independent kingdom was established, the Regnum Asturorum, which was to become the cradle of the incipient Reconquista (Reconquest). In the 10th century, the Kingdom of Asturias gave way to the Kingdom of León, and during the Middle Ages the geographic isolation of the territory made historical references scarce. Through the rebellion of Henry II of Castile in the 14th century, the Principality of Asturias was established. The most famous proponents of independence were Gonzalo Peláez and Queen Urraca, who, while achieving significant victories, were ultimately defeated by Castilian troops. After its integration into the Kingdom of Spain, Asturias provided the Spanish court with high-ranking aristocrats and played an important role in the colonization of America. Since 1388, the heir to the Castilian (later Spanish) throne has been styled Prince of Asturias. In the 16th century, the population reached 100,000 for the first time, and within another century that number would double due to the arrival of American corn. During the 18th century, Asturias was one of the centres of the Spanish Enlightenment. The renowned Galician thinker Benito de Feijóo settled in the Benedictine Monastery of San Vicente de Oviedo. Gaspar Melchor de Jovellanos, a polymath and prominent reformer and politician of the late 18th century, was born in the seaside town of Gijón. The Industrial Revolution came to Asturias after 1830 with the discovery and systematic exploitation of coal mines and iron factories at the mining basins of Nalón and Caudal, that turned Asturias into an industrial region. At the same time, there was significant migration to America (especially Argentina, Uruguay, Puerto Rico, Cuba and Mexico); those who succeeded overseas often returned to their native land much wealthier. These entrepreneurs were known collectively as Indianos, for having visited and made their fortunes in the West Indies and beyond. The heritage of these wealthy families can still be seen in Asturias today: many large modernista villas are dotted across the region, as well as cultural institutions such as free schools and public libraries. Asturias played an important part in the events that led up to the Spanish Civil War. In October 1934 the Asturian miners and other workers staged an armed uprising (see Revolution of Asturias) to oppose the coming to power of the right-wing CEDA party, which had obtained three ministerial posts in the centralist government of the Second Spanish Republic. For a month, a Popular Front Committee exercised control in southern Asturias, while local workers committees sprang up elsewhere in the region. A war committee dominated by anarcho-syndicalist supporters took power in Oviedo . Troops under the command of a then unknown general named Francisco Franco Bahamonde were brought from Spanish Morocco to suppress the revolt. Franco applied tactics normally reserved for overseas colonies, using troops of the Spanish Legion and Moroccan troops: ferocious oppression followed. As a result, Asturias remained loyal to the republican government during the Spanish Civil War, and was the scene of an extraordinary defence in extreme terrain, the Battle of El Mazuco. With Franco eventually gaining control of all Spain, Asturias — traditionally linked to the Spanish Crown — was known merely as the "Province of Oviedo" from 1939 until Francos death in 1975. The provinces name was restored fully after the return of democracy to Spain, in 1977. In the 50s and 60s the industrial progress of Asturias continued with the constitution of national enterprises like Ensidesa and Hunosa, but the 80s was the decade of a dramatic industrial restructuring. On December 30, 1981, Asturias became an autonomous community within the decentralized territorial structure established by the Constitution of 1978. Rafael Luis Fernández Álvarez, who had previously served as the President of the Regional Council since 1978, became the first President of the Principality of Asturias, upon the adoption of autonomy. 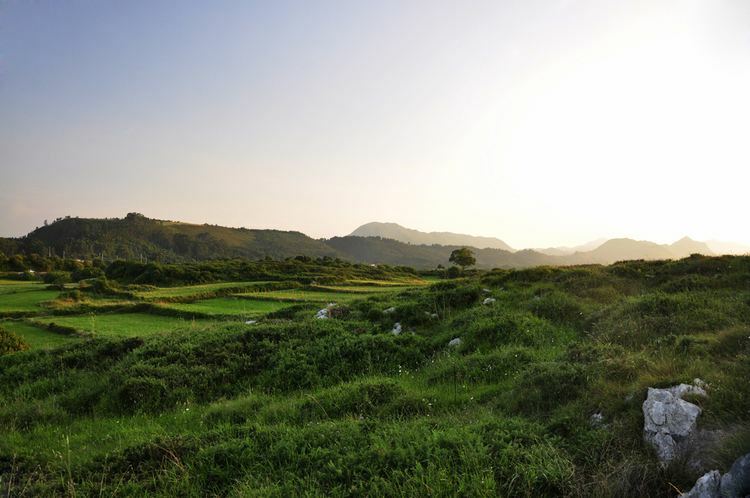 The Asturian regional government holds comprehensive competencies in important areas such as health, education and protection of the environment. As of May 2011, the President of the Government of Asturias was Francisco Álvarez-Cascos, of the Foro Asturias (FAC), succeeded by Javier Fernández in 2012. The Cantabrian Mountains (Cordillera Cantábrica) form Asturiass natural border with the province of León to the south. In the eastern range, the Picos de Europa National Park contains the highest and arguably most spectacular mountains, rising to 2,648 metres (8,688 ft) at the Torrecerredo peak. Other notable features of this predominantly limestone range are the Parque Natural de Redes in the central east, the central Ubiñas south of Oviedo, and the Parque Natural de Somiedo in the west. The Cantabrian mountains offer opportunities for activities such as climbing, walking, skiing and caving, and extend some 200 kilometres (120 mi) in total, as far as Galicia province to the west of Asturias and Cantabria province to the east. The Asturian coastline is extensive, with hundreds of beaches, coves and natural sea caves. Notable examples include the Playa del Silencio (Beach of Silence) near the fishing village of Cudillero (west of Gijón), as well as the many beaches surrounding the summer resort of Llanes, such as the Barro, Ballota and Torimbia (the latter a predominantly nudist beach). Most of Asturiass beaches are sandy, clean, and bordered by steep cliffs, on top of which it is not unusual to see grazing livestock. The key features of Asturian geography are its rugged coastal cliffs and the mountainous interior. The climate of Asturias, as with the rest of northwest Spain, is more varied than that of southern parts of the country. Summers are generally humid and warm with considerable sunshine but also some rain. Winters are cold with some very cold snaps. The cold is especially felt in the mountains, where snow is present from October till May. Both rain and snow are regular weather features of Asturian winters. In coastal or near-coastal areas, daytime high temperatures generally average around 12 °C (54 °F) – 13 °C (55 °F) during winter and 22 °C (72 °F) – 23 °C (73 °F) in summer. Asturias has two main football teams: Sporting de Gijón and Oviedo, which have played over 35 seasons in First Division. Other current notable sports teams are Oviedo CB (basketball) and AB Gijón Jovellanos (handball). Racecar driver Fernando Alonso is a two-time Formula One world champion. Also, cyclist Samuel Sánchez won a gold at the Olympic games. For centuries, the backbone of the Asturian economy was agriculture and fishing. Milk production and its derivatives was also traditional, but its big development was a byproduct of the economic expansion of the late 1960s. Nowadays, products from the dairy cooperative Central Lechera Asturiana are being commercialised all over Spain. While Asturias is especially known for its seafood, the most famous regional dish is fabada asturiana, a rich stew typically made with large white beans (fabes), shoulder of pork (lacón), black sausage (morcilla), and spicy sausage (chorizo). Asturias is especially known for its seafood, such as fresh squid, crab, shrimp and sea bass. Salmon are caught in Asturian rivers, notably the Sella; the first fish of the season is called campanu (Bable word for campana), a bell tolled to signal the first catch. Apple groves foster the production of the regions traditional alcoholic drink, a natural cider (sidra). Since it is natural and bottled without gas, when Asturian cider is served, it is poured in a particular way, el escanciado: the bottle is held above the head allowing for a long vertical pour, causing the cider to be aerated when it splashes into the glass below. After drinking most of the content, it is customary to splash a little out onto the ground, as a way to clean the glass of any lees for the next serving. Traditionally, the same glass is refilled and passed around, with everyone drinking from it in turn. Asturian cheeses, especially Cabrales, are also famous throughout Spain and beyond; Asturias is often called "the land of cheeses" (el país de los quesos).